A well Marked Low pressure area off Andhra coast is seen persisting and is likely to bring heavy rains along coastal Andhra and Telangana. The rainfall activity over Konkan and surrounding ghat regions is expected to increase with heavy to very falls. Chennai region may get some isolated thunder showers in the evening / night after a warm afternoon. The lower level trough will induce Thunderstorms over Central India and Chattisgarh at the same time. 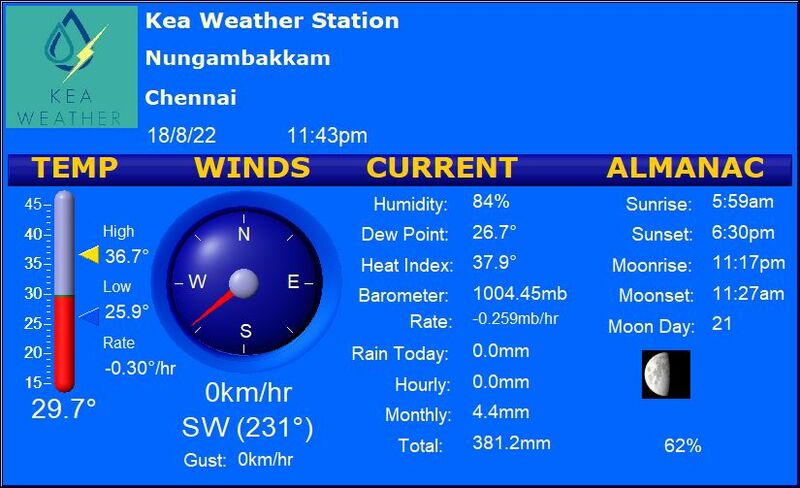 South Tamilnadu will continue to get see hot and unforgiving weather. Chennai – Few clouds up in the morning. Day would continue to be warm with temperature maximizing around 34-35 C. Chances of isolated thunder showers over the region. Madurai – Fairly hot day ahead with maximum temperatures of around 38 C.
Trichy – Searing heat on the cards as the mercury could rise up to 37 C. A warm night may add up to the misery. Coimbatore – Typically cool and comfortable morning. Getting warmer with maximum temperatures of around 34 C. Nights to stay comfortable. Vellore – Warm day ahead with the temperature capping around 35 C. Chances of a Thunderstorm during evening/night. Copyright © 2019 Kea Weather Blog. All rights reserved.